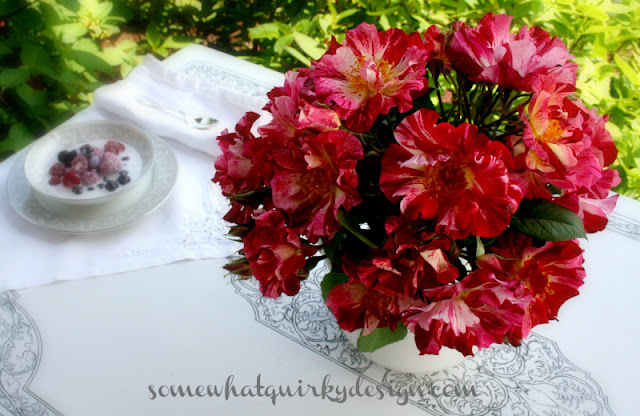 Somewhat Quirky: Ladies - Get Out Your Vases! Ladies - Get Out Your Vases! So I got an email from a magazine website that was doing a round-up of "easy summer centerpieces" wanting to know if I had anything I wanted them to look at. I laughed out loud. Don't they know I'm not a tablescape person? Don't they know that my horizontal surfaces are seldom clear enough to fit in a centerpiece? Do you think they would like me to send pictures of that? I was very sort of ashamed. Of all times of the year - why would I not at least have a few floral arrangements? I mean the hydrangeas aren't yet blooming, but I've got a few other flowers might be used for centerpieces. Am I so lazy that I can't gather up some bottles, jars, pitchers, and vases and slap together an occasional arrangement? 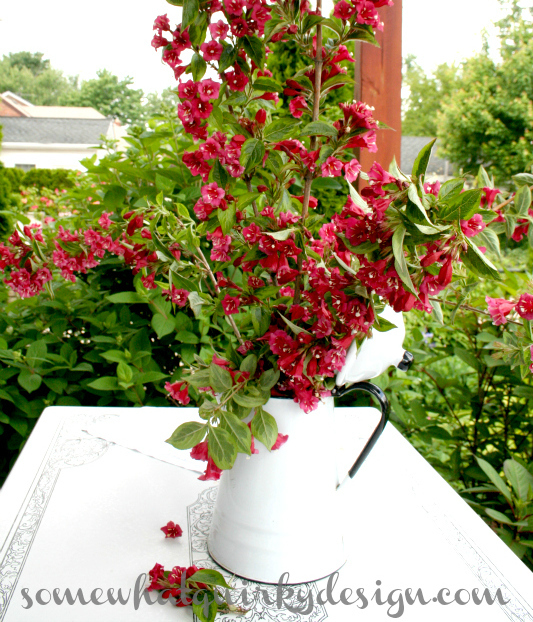 I mean clematis and weigela aren't typical flowers to use in arrangements. But they're pretty. And that weigela bush is on the side of the house and I hardly ever get to see it. So why not cut off some branches and enjoy them? To not do that would just be silly. And then there are the roses. And this stonewear that I picked up at an estate sale last weekend. What on earth was I thinking? I can hardly even see this rosebush from the porch. I should cut off ALL of the roses! And these? 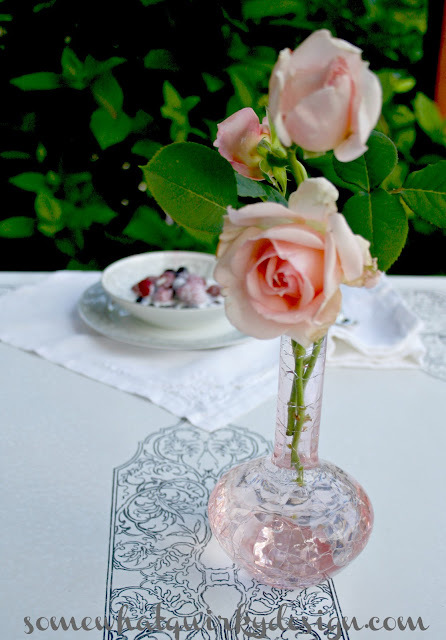 Why wouldn't I want these lovely pink things on my table? I will never be centerpieceless again. At least for the summer. What flowers do you have that you're not taking advantage of? Get out your vases and dance! I accept your challenge. Nothing yet however is blooming here. First year I will have Peonies, and I'm not sure if my hydrangeas made it. I have shrub roses, weigela, lilac, lordy what else can I bring in the house that I NEVER do? Centerpieceless ........hmmmm...love that word. So descriptive! I want a wegelia too...they are so pretty. I think you did just fine with your centerpieces and Bliss should bring the ducks in....if she can get them to stand still in the middle of the table that is. All of them are beautiful, and elegant! Love all your pretty flowers. That is the reason to plant them so you can cut them and put them throughout your home! Enjoy! What a coincidence, I was walking my dog around the neighbourhood today and saw a lovely shrub and didn't know it's name ! 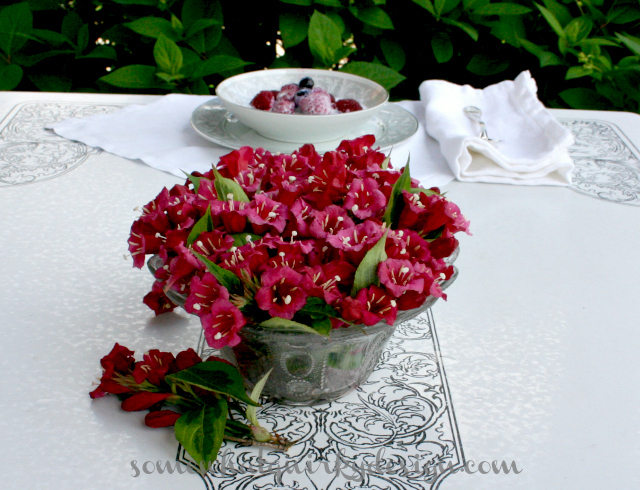 There it is as one of your pretty centrepieces - weigela - thanks Karen ! Geez, Bruce usually gets to them before I do! Yours are gorgeous, though. Well, I certainly don't have that big of a selection of flowers, but my lilacs didn't die, so I could use those. I'm not a tablescape person, either. It's just plates and stuff...why is it so hard?!! Oh geeze...now I need to have a centerpiece on my table next week!!! Yours are lovely and those berries look delicious! I guess I'm lazy too. 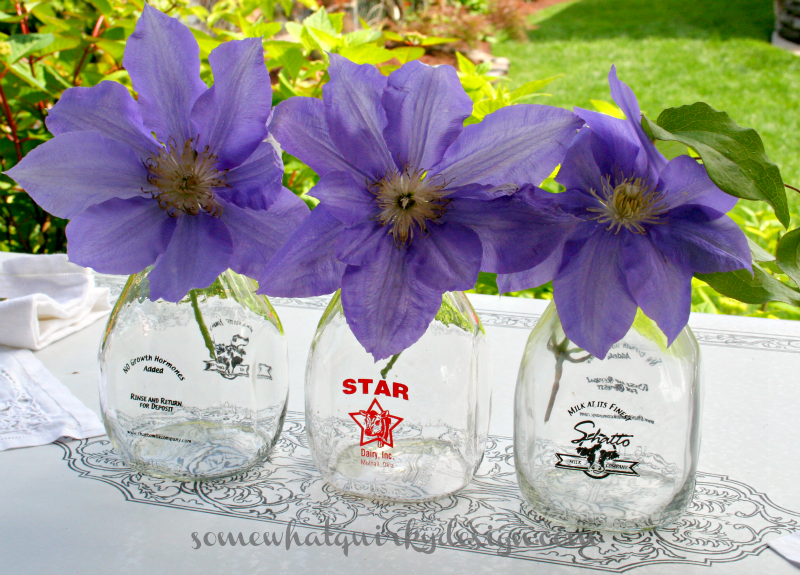 I hardly ever cut my flowers from the garden and I have vases up the wazoo around here. Your tablecloth is beautiful. I love all of them - but that first photo with the 3 vases? Beautiful table arrangements Karen - and beautiful photos!